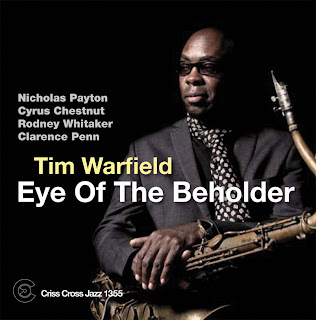 Personnel: Tim Warfield: tenor and soprano saxophones; Nicholas Payton: trumpet; Cyrus Chestnut: piano; Rodney Whitaker: bass; Clarence Penn: drums. I’m unfamiliar with Tim Warfield’s work, but I caught him performing a smoking hot solo on a YouTube clip, and I thought I should check out his recent recording, Eye of the Beholder. “Blues for Mr. Bill” starts straightforwardly enough, with a walking, mid-tempo, blues bass line, which is eventually joined by Warfield playing a simple blues theme on tenor. But then Warfield and Payton start playing some off-center lines, and the cut veers away from a regular blues. Warfield then plays a gruff, slightly outside solo with a solid, no-nonsense tone. (He displays some wit in his solo, playing a warped quotation from “Look Away, Dixieland.”) Payton’s solo isn’t as gruff, but he also refuses to stay on a straight blues path. Chestnut stays in octaves for a good part of his solo, after which there is a return to the innocent, walking bass line. At the end of the cut, after Warfield repeats the tune’s theme, the iconic end of Miles Davis’s “The Theme” is played, but the last note is left off, a reminder of the slightly sinister previous activities. On Marlon Jordan’s compelling blowing vehicle, “The Undaunted” (which has a harmonic structure similar to the Coltrane tribute on Chick Corea’s Three Quartets), Warfield gets in a fine angular solo, combining elements of Joe Henderson and Coltrane, including some growling lines and upper register screaming. Payton plays an accomplished solo in a Freddie Hubbard style, and Chestnut plays an engaging, McCoy Tyner-esque solo. Penn gets in a good drum solo that is both fiery and controlled. All the soloists on this cut really establish their credentials as top-notch players. The project come off the rails a bit with “Tide a Dish I,” a free-for-all of unfocused, meterless improvising that briefly falls into a slow groove, with occasional whoops of “Tide a Dish!” Lasting almost three minutes. It’s hard to see the point of doing this kind of thing. Things get back on track with a standard done in a non-standard meter, a relaxed, swinging version of “I Remember You” in 5/4 time, including a pretty introductory line. Warfield plays a fleet tenor solo, but one that doesn’t develop much. Payton plays an elegant, gliding solo so mellow that his trumpet sounds like a flugelhorn, and Chestnut’s solo sparkles. After Warfield restates the theme, the cut ends with a repeat of the pretty introductory line, with Penn soloing in the background. Payton’s “The Backwards Step” starts with some free-form playing by trumpet and soprano sax, with some loose, meterless accompaniment from the rhythm section. The cut develops into a lower mid-tempo tune with a restrained, delicate theme played by the horns in unison and in harmony. Payton starts his solo in this tempo, and with a beautiful phase that spirals into the stratosphere, the tempo goes double time. His solo remains interesting and virtuosic throughout. Staying in double-time, Warfield plays a well-constructed, highly controlled solo on soprano. Chestnut then plays a persistently swinging solo, first in the double-time section, and then slowing things down, which brings in the horns again on the theme. “Second Thoughts” is a good, straight-ahead jazz tune by Mulgrew Miller, taken at mid-tempo. Warfield plays a solid, straightforward solo, sounding like a combination of Coltrane and Hank Mobley. Payton plays a relaxed solo, just strolling through the changes. Chestnut plays an intensely swinging, glittering solo, with fast runs and a lot of rhythmic variety. Whitaker adds a fleet-fingered, melodic solo. This cut is a real gem. The recording ends with Warfield’s “Forever, One Day at a Time,” a quiet, mid-tempo tune. Warfield plays an inquisitive, patient solo. Payton, using a mute, also plays a low-key solo, but he adds some heat and drama near the end. Chestnut plays a brief solo, but his accompaniment is noteworthy throughout the cut, decorating the background with bright arpeggios and glissandi. Eye of the Beholder is a solid jazz recording, reminding me of the early recordings of Wynton and Branford Marsalis. Warfield is a very capable sax player, generally utilizing a combination of Coltrane’s and Hank Mobley’s styles, and he couldn’t ask for a better partner than Payton. Cuts 2, 4, 5 and 8 are extremely good. The two “Tide a Dish” cuts were bad ideas, in my view, and without them the recording would have been stronger. Unfortunately, the Warfield-composed cuts are the weakest on the recording, though they are ok (except for the misbegotten Tide-a-Dishes, of course, which really aren’t compositions, anyway). These musicians seem to up their game depending on the material they play, and when they’re engaged by their material, it’s about as good as jazz gets.